Faith Sampe has always been crazy about square-body Chevys but never could find one that would be an easy fix in her home state of Wisconsin. Then she got one look at the 1991 crew cab pickup for sale down the road. It had a 6-inch lift and all-new sheet metal. She was sold. “Once I saw it, I knew I wanted it,” Faith says with a grin. Her goal firmly in mind, Faith worked in high school so she could afford the asking price. It took a year of saving, but in the end she finally had enough to claim her truck, and had plenty of time to dream up the perfect build plan to boot. Faith was more than ready to put her own stamp on this Chevy—with the right partner, of course. Faith’s father Abe worked in construction, so she was raised around heavy machinery and trucks. 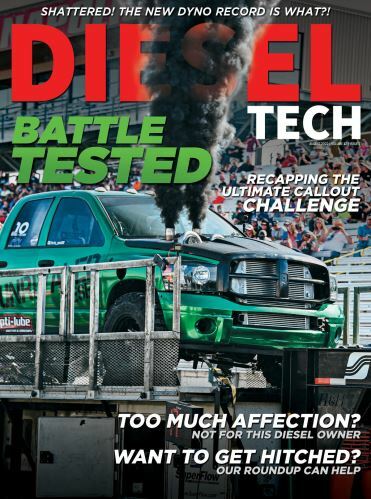 “As I grew older I took more and more interest in diesels and equipment. My brother and I used to help my grandpa fix things on his dump truck that he had,” Faith shares. So you could say this build was a long time in coming for the Sampes. First, Faith and her father painted her truck a metallic grey with purple accent parts and blackened the frame. They also did all the fabrication work to the frame to prepare for a motor swap from the 350 Chevy to a 12-valve Cummins. “I chose the 12-valve Cummins because I prefer a Cummins but wasn’t a fan of the Dodge body style, so I wanted to make a 12-valve square-body ‘Chummins,’” she explains. Next came the installation of the 47RH transmission, and Faith followed up by adding 75hp over injectors. The duo then cut the fuel plate and turned up the screw on the fuel pump before putting the truck back together and casting an eye over the exterior. Faith decided to replace the vent window so she could put 2000-07 Chevy tow mirrors on the truck. Some 20-by-12 Anthem Aviators wrapped in 35-inch Kumhos followed up with a little interior work rounded out Faith’s upgrades—so far. Over the summer, for example, Faith wants to finish the interior and then look into getting air ride suspension and possibly doing another paint job. “There’s always room to make some upgrades on the motor as well,” she adds. This “Chummins” is designed to be her daily driver with some towing on the side, after all. But for what she has under her belt so far, she couldn’t be happier. Along with all of the positive role models and support, Faith had to weather her fair share of trouble as well. But she chooses not to take any of it personally. Because your dreams, like a 1991 square-body Chevy, are worth putting your faith into.